You know how they say that a married couple eventually starts looking like one another? I think Mr. Sweetness and I are reaching that point. And we look the same when we’re silly! Pine cones are so amusing! 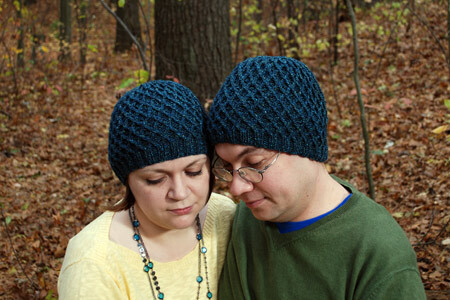 Pattern: His and hers Koolhaas hats. The details of his are documented here. To make mine, I knit the woman’s size (4 repeats of the chart), but otherwise didn’t change a thing. I think my hat came out just a little bit too shallow. I know 5 repeats, which I used for Walter’s hat, would have been too deep. A longer stretch of ribbing, or 4.5 repeats, would have been perfect for mine. Unfortunately, I didn’t have enough yarn to do that. If you remember, his hat took up just a bit more than 1 skein, so I had less than a full skein to make mine work. I had barely a yard left over when I was done! The other issue is that while Silky Tweed is a delightful yarn in all respects, I find it a bit itchy against my forehead. Anyway, I’ll have to test it out to see if it’s workable. 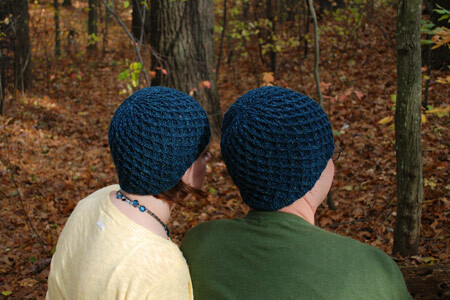 Maybe it’s a bit cheesy to have matchy-matchy hats like that, but I really enjoyed knitting this pattern, twice! 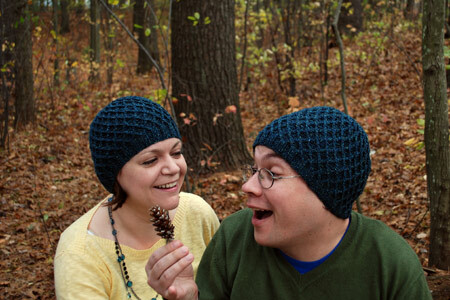 Plus, matching Koolhaus hats is undeniably better than the porcupine disaster that (thankfully) never was ;). My husband would never allow such cuteness. If we are both wearing plain black tee shirts, he goes and changes his shirt. He is terrified people would think that we are intentionally dressing alike. No fun at all! What a cute photoshoot! Yes, I can see the resemblance. I like the matchy-matchy look, but I don’t think my husband would go for it. ack! You guys could not be cuter. Love the dueling Koolhaases! The hats are awesome. This is a really sweet post! Ha – I love matchy-matchy. What a great post. Too cute. I love the matching hats. You two are just adorable! Awwww!! You guys are so cute! Oh heck, I thought you two looked similar when you showed me engagement pictures. 😉 Nice hats. So cute! I love that pattern, I made one for my brother for Christmas last year. So cute! I think it’s hard to be cheesy in such an elegant hat as Koolhaas. Cheesy is the new thing! Didn’t you know? The hats look great and I envy you for being in New England this time of year! Great photo story! Your hats looks beautiful, I love the color! Very cute! I’ve been wanting to make one of those hats for a while, just haven’t gotten to it. My husband (of 16 years) just asked me (for the second time) to make him a sweater. The sweater he wants me to make? A copy of the one I just made for my 4 year old son. Too cute! I needed the chuckle today. The hats look great! Oh, I’m honored! They look great… love the color! How cute are you two? I love the matchy-matchy hats! Your Koolhaas hats are gorgeous. Thank you for reminding me of how much I like that pattern (I really needed to make mine with a yarn with less halo, because the patterning is obscured). The Koolhaases are gorgeous. My family amuses itself at table by trying to pose as a holy card; it’s surprisingly difficult since it’s hard not to laugh. Your second photo is holy cardish – were there married saints? I can’t remember. 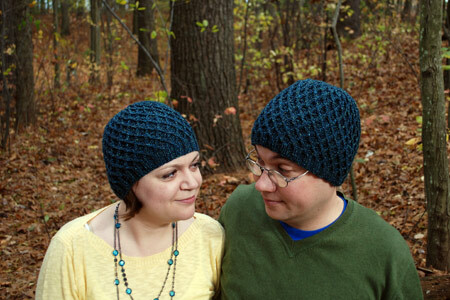 You and your sweetie are adorable in your matching hats. Thank you for sharing! Mr Sweetyness has a name! – Walter. Love it, and love the hats, together and apart they will be great. OMG! How cute are the two of you!? I love the hats, the photography, you two, the cuteness, everything! Now I await to see mr. sweetness and/or grumpy junior. Seeing you two together (with your matching Koolhaas’) makes me smile. See? I’m doing it again. LOVE the hats , love the color. I wonder if I could get that pattern to work in Koigu? My husband and I have matching Thorpe’s. I try really hard to not wear mine while he’s wearing his! You two are adorable, and the hats are gorgeous! Not cheesy at all, AWESOME! Great hats! I really like the color. Maybe adding a hat-band would help? I made a hat for my dad and knit a contrasting edge/inner-band using a softer yarn. It makes an interesting stripe, and is much more comfortable than itchy woollie-wool on the forehead. That would also add some length. Maybe black, or any leftover ‘eggplant’ purple? I noticed that you and your new husband resemble one another the first time I had a glimpse of you two together, which, I think, were the wedding photos. Very cute…..